Bacon Slaying Takes New Turn In the company of a full-patch Hell's Angel when assassinated. Labels: Bacon Slaying Takes New Turn In the company of a full-patch Hell's Angel when assassinated. The fatal shooting of Red Scorpions gang boss Jonathan Bacon and the wounding of a known member of the Hells Angels has raised questions about what they were doing together. R-C-M-P Superintendent Pat Fogarty, with the anti-gangs task force, says their affiliation was likely based on making drug profits. He says there's no loyalty among gang members, who often work for different players. Thirty-year-old Red Scorpions gang boss Jonathan Bacon was gunned down on Sunday afternoon while in the company of a full-patch Hells Angels member and an alleged member of the Independent Soldiers. HELLS Angels have been linked to an alleged vendetta against the Ibrahim family after a bikie was arrested in connection with drive-by shootings targeting the family. The bikie was arrested and a house raided this week over attacks on two properties linked to the Ibrahim family, one of which is the home of Sydney nightclub entrepreneur John Ibrahim. Police raided the house at Wetherill Park about 6.40am on Tuesday and arrested a 21-year-old Hells Angel. They allegedly seized three shotguns, three rifles, ammunition, cocaine and steroids. The raid followed the drive-by shooting of a home allegedly owned by the Ibrahims at Merrylands on June 30, in which several shots penetrated the property. The home, located behind the home of Mr Ibrahim's mother Wahiba, was occupied by renters. A woman aged in her 30s and a seven-year-old boy who were inside were not injured. About 11.30am the next day, police were called to Mr Ibrahim's clifftop home on George St, Dover Heights, after it was shot at and ammunition casings discovered. It was allegedly the third time shots had been fired at the home. The other incidents were not reported. Police formed Strike Force Bairestow to investigate the shootings. The Hells Angel was released without charge pending further inquiries. The Hells Angel bikie boss who took a month to find someone to post his bail on fraud charges was charged just hours before his release with extortion offences. Labels: The Hells Angel bikie boss who took a month to find someone to post his bail on fraud charges was charged just hours before his release with extortion offences. Felix Lyle, 54, the president of the Sydney chapter of the Hells Angels, was about to walk from Long Bay jail on Wednesday when police sat him down for a chat. They charged him with demanding money with menaces and participating in a criminal group. He faced Burwood Local Court on Thursday and did not apply for bail, which was formally refused. "He was about to come out yesterday afternoon and he's been interviewed by other detectives," his solicitor Martin Ricci told AAP on Thursday. "And at about four o'clock yesterday afternoon he was charged with a further offence. "He's absolutely shocked and vigorously denies it." The charges relate to an incident on July 8, when five men demanded cash from the owner of a car yard on Parramatta Road, Burwood, in Sydney's west. Five men, aged 24, 26, 27, 29 and 30, were arrested at the scene. All are said to be bikie gang members. Four days earlier, several luxury cars were stolen from the yard, police say. Lyle has been in custody since July 22 on unrelated charges and was granted bail but required to post a $100,000 surety bond as a condition for his release. The officer in charge had refused to vary the condition, Mr Ricci said, and the Director of Public Prosecutions (DPP) had indicated it would oppose a lesser amount. But Mr Ricci successfully applied last week to have the surety amount reduced to $20,000. Whoever posted Lyle's bail was required to have no criminal record, not to have ever been a bankrupt and not to have provided bail in a continuing criminal matter. "Out of the blue on Tuesday afternoon an acceptable person had put up the deposit - I was unaware he was going to do it," Mr Ricci said. Another condition required Lyle to surrender all passports, which Mr Ricci was ready to do on his behalf to the police officer in charge. "There was obviously something going on because the cop was being difficult and couldn't meet me," Mr Ricci said. "And then he finally fessed up and said detectives are trying to interview him about this other matter. "So everything had been met and then they'd interviewed him in relation to this other matter and he was then charged with that and taken to court this morning." Mr Ricci said Lyle's chances of being bailed on the extortion charges were "quite good". "It's just an extortion matter," he said. "I can't imagine we'll struggle too much. "It's not as if he's on bail committing offences." Lyle's matter will next come before Burwood Local Court on August 24. Police have arrested two associates of the Rock Machine gang after a crash that sent three officers to hospital. Labels: Police have arrested two associates of the Rock Machine gang after a crash that sent three officers to hospital. The three officers were hurt in a collision Tuesday at about 12:30 a.m. after officers tried to stop a Dodge Avenger near Antrim Road and Rockspur Street, part of a police investigation of an ongoing biker-gang battle that's simmered throughout the summer. Police said the Avenger made "quick evasive manoeuvres" that caused the crash. After the Avenger allegedly hit two marked police cruisers and an unmarked truck, police took two men and a woman into custody and seized a loaded handgun. Two men the police arrested have ties to the Rock Machine biker gang, said a source, though police would not specify how Tuesday's vehicle chase was tied to gangs. Officers from the organized crime unit, the tactical support team and canine unit were involved in the traffic stop. "Getting into the specifics of that investigation is not something I am prepared to do, nor does it provide the public with any information that we haven't already provided them," said Winnipeg Police Service spokeswoman Const. Natalie Aitken, who said the investigation has been underway since mid-July. Aitken said police have taken "very proactive, very aggressive measures" in an ongoing gang conflict. "There's been a number of violent incidents that have occurred in our city and that is something that's not going to be tolerated," she said. Aitken said the Avenger caused the crash. "I don't think our officers ever have the luxury of dealing with any routine traffic stop anymore," she said. By midday Tuesday, two of the three officers had been treated and released from hospital. One remained at hospital, however, with a serious upper-body injury. Police said the three police vehicles involved in the crash had serious damage. Joseph Jordan Carl Choken, 19, Guy Wesley Vernon Stevenson, 21 and Amanda Kay Freeman, 23, face charges, including possession of restricted firearms. Choken had an outstanding warrant for arrest, and Stevenson is charged with three probation breaches and possessing a weapon contrary to a probation order. The three were in custody Tuesday, said police. Freeman and Choken do not have prior criminal convictions. However, Stevenson was found guilty in 2009 of uttering threats and possessing a prohibited or restricted firearm with ammunition, as well as a robbery and assault with a weapon. Police are bracing for “extreme violence” after the release from jail of former Coffin Cheater turned Finks bikie Troy Mercanti. Labels: Police are bracing for “extreme violence” after the release from jail of former Coffin Cheater turned Finks bikie Troy Mercanti. Assistant Police Commissioner Nick Anticich said officers were on high alert after Mercanti walked free from Casuarina Prison more than 2½ years after being jailed for causing grievous bodily harm in a bar room brawl in Northbridge. 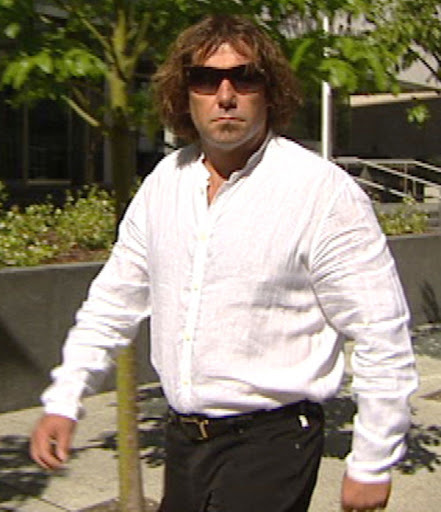 Within hours of his release, Mercanti took a Jetstar flight to South Australia where he was met by at least six Adelaide Finks. They were watched by Australian Federal Police officers. Detectives from the Crime Gangs Task Force pulled over some of the gang members as they left the Adelaide Airport carpark. Adelaide has the biggest contingent of Finks bikie members in Australia. Mercanti made himself a target for the Coffin Cheaters by defecting to the rival Finks gang just months after he was booted out of his old club in early 2008. Within months of joining the Finks, he was shot at by an unknown sniper while motorcycle riding with two Finks in Wooroloo. The sniper missed Mercanti but one of his companions was hit and Mercanti crashed his machine. On his release yesterday, Mercanti was warmly greeted by up to a dozen Finks who drove in a convoy back to his Duncraig home. Mr Anticich said police believed his release could spark further violence between the bikie gangs, who clashed in October in a bloody brawl at the Kwinana Motorplex. Several Finks were beaten with baseball bats and one had fingers severed. “Obviously there is a bit of history between Mr Mercanti and members of outlaw motorcycle gangs,” Mr Anticich said. “The fact he has been released from prison puts him at risk. But we take the view that potentially he is at risk of being a victim but is also potentially a perpetrator. Mr Anticich said police were well prepared to respond to any bloodshed between the gangs. Mr Anticich said police would monitor Mercanti to ensure that he did not breach a prohibition order that bans him from entering licensed premises in WA. Mercanti was last year banned for five years, with police citing his 31 criminal offences and several unprovoked bashings as justification for the prohibition order. Hells Angels sergeant-at-arms Ricky W. Jenks pleaded guilty in federal court in Spokane today to a charge of being a felon in possession of a firearm, but the judge handling the case said he wants more time before accepting the plea. U.S. District Court Judge Justin Quackenbush questioned why federal prosecutors accepted the plea agreement calling for only two years in prison when Jenks faced twice that prison time had the case proceeded to trial. “I have indicated I have reservations about a two-year sentence given your criminal history,” Quackenbush told Jenks, who has two previous felony convictions, including one for manslaughter. The judge ordered defense attorney Tracy Collins and Assistant U.S. Attorney Aine Ahmed to submit written arguments within a week as to why they agreed to the plea agreement. If Quackenbush decides not to accept the agreement, the matter will be scheduled for trial, which was previously set to begin on Monday. Ahmed said he understood that the agreed-upon sentencing recommendation is less than half the time Jenks faced at trial. “Realistically, I can tell you the U.S. government’s primary concern is dragging people in here who don’t want to be here,” Ahmed said. Quackenbush said he would not interject himself into the plea negotiations. At the hearing, Jenks, 33, acknowledged that one of several guns found at a March 3 raid of the motorcycle gang’s clubhouse at 1308 E. Sprague Ave. was his. Since he is a convicted felon, he’s barred from possessing guns or ammunition. “I’ll accept your plea of guilty but reserve determination whether or not to accept the plea agreement,” Quackenbush said. He set sentencing for Oct. 7, provided he accepts the plea. Quackenbush said he needed more information about the availability of other family members and a doctor’s explanation of her condition. POLICE have arrested 12 past and present members of a Launceston bikie gang over a suspected drug trafficking ring. Labels: POLICE have arrested 12 past and present members of a Launceston bikie gang over a suspected drug trafficking ring. After an investigation into the Rebels Motorcycle Chapter, police say they seized 800g of methyl-ampethamine with a street value of $200,000 and a quantity of cash. They allege that a further $250,000 worth of drugs has been trafficked in the past six months. Police have so far arrested 12 past and current members of the group, and say they expect further charges to follow. All 12 have been charged with trafficking in methyl-amphetamine and summonsed to appear in the Launceston Magistrates Court.